UNICA, the Brazilian sugarcane industry association, has announced the 2017-’18 harvest is substantially complete, with approximately 25.22 billion liters (6.7 billion gallons) of ethanol produced since the beginning of the season. Recent trials of Fluid Quip Process Technologies's 50 percent purity protein product add to the portfolio of nutritional data the company has collected for the past eight years. The product is made using FQPT's Maximized Stillage Co-Products system. Christopher Wense, a former steel mill worker who has returned to school while working full-time in the U.S. ethanol industry, is this year’s student scholarship winner to attend the Renewable Fuels Association’s National Ethanol Conference. The Renewable Fuels Association and Transcaer are jointly hosting four ethanol safety webinars this year for ethanol emergency response teams. These webinars will be held on Jan. 31, March 28, May 23, and July 25. Growth Energy has announced that American drivers have logged yet another billion miles on clean burning E15 in just the past three months. The total number of miles driven on E15 now sits at more than 3 billion. JTI Services LLC has joined the Minnesota Bio-Fuels Association as a vendor member. 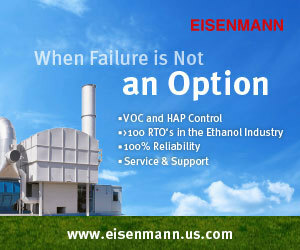 The company provides electrical preventative maintenance and safety services to ethanol plants in southern Minnesota. The Bolivian government announced its intention to establish an ethanol blend mandate during a December seminar conducted by the U.S. Grains Council. The mandate is start at 10 percent in 2018 with goals of mid-level blends in coming years.